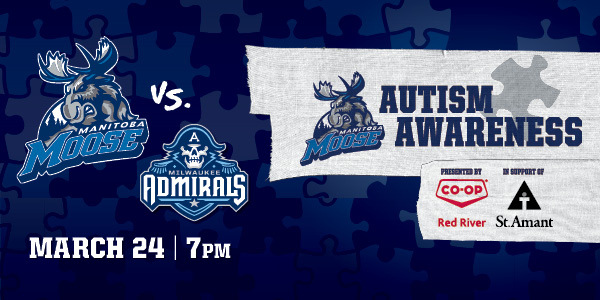 St.Amant is proud to be the charity partner for the Manitoba Moose’s Autism Awareness campaign, highlighted by Autism Awareness Night, presented by Red River Co-op on Friday, March 24 at 7 p.m. Throughout the month of March, leading up to Autism Awareness Night, limited edition player puzzles will be on sale at all eight Moose home games. The puzzles feature Moose players Eric Comrie, Patrice Cormier, Chase De Leo, Quinton Howden, JC Lipon and Jack Roslovic. Each puzzle is autographed by the player it features and will be available for $20. Every fan purchasing a puzzle will be entered into a draw to win a Manitoba Moose Autism Awareness jersey. Autism Awareness Night on March 24 will feature the Moose wearing special edition Autism Awareness jerseys involving a puzzle piece design. Select player jerseys will be auctioned off at the game with the rest available online in the days following the game. Net proceeds from the Autism Awareness jerseys and player puzzle sales will be donated to the St.Amant Autism Program. Through last year’s Manitoba Moose partnership, St.Amant Autism Classrooms received over $16,000 toward outfitting the classrooms at Wall Street and 440 River Road with smartboards, leap pad learning games, iPads, toys and decorations. Tickets for Manitoba Moose Autism Awareness Night on Friday, March 24 are available at moosehockey.com/tickets.